When you have a special occasion to celebrate, or just want to create memories over a memorable meal, here are our top picks for upscale dining in Killington. The Foundry has a rustic and quintessentially Vermont atmosphere. The post-and-beam restaurant was built in the 1970s and features a large stone fireplace and chandeliers. There is an upscale dining room and a more casual tavern, both with the same menu options. Like most establishments in Killington, there is no dress code – some choose to dress up, while others come straight from a day of skiing on the mountain. Tuesday nights feature a Pasta Special with a glass of wine for $16.95. There’s live music and dancing on the weekends, and ice-skating on the pond outside six days a week during the winter season, with an $8 skate rental and $5 fee to skate. The Foundry is elegant enough for couples, but friendly to families as well. You can enjoy a nice sit-down dinner by the fireplace, then stroll over to the bar for live entertainment and drinks. This is one of our favorite places to dine on the mountain, with a creative menu featuring items like Pan Seared Duck with caramelized onion and bacon jam, corn puree and roasted brussels sprouts, and a Bone-In Pork Chop with apple chutney, mashed potatoes and roasted root vegetables. The cocktail menu also aims to please, with drinks made from maple-infused bourbon … and one delicious Moscow Mule. Save room for dessert. 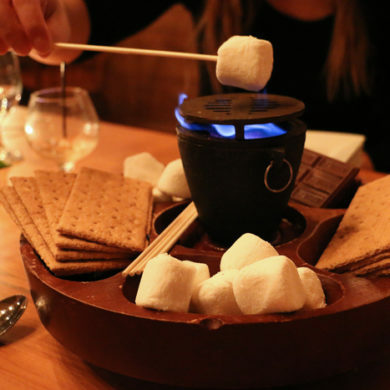 At The Foundry, you can make your own s’mores over a little fire. Choices is all about, well, choices. Chef Claude has a reputation for serving some of the best food in the area. Everything is homemade. The wine list is extensive, with many varieties available by the glass. It’s a wonderful place for a 6 p.m. dinner and drinks. Sunday Brunch is served during the winter season from 11 a.m. to 2:30 p.m. The food is excellent, and the atmosphere is quiet and casual. Chef Claude’s house specialty is rotisserie, but the menu has a nice range of salads, sandwiches and plated entrees. Portion sizes are hearty – you can order an appetizer or full-size dish. Daily specials utilize the most robust flavors of every season, creating a farm-to-table dining experience. Choice’s is Killington’s oldest chef-owned restaurant. Claude graduated from the Culinary Institute of America and is known for his rotisserie lamb, chicken and stuffed pork. His 60-item menu offers choices galore, from nachos to escargot, burgers to rack of lamb. As part of the VT Fresh Network, Claude partners with nearby farms to serve fresh, local food. The restaurant also supports local artists by hanging their work on the walls. You can order the same menu items from the dining room or bar area, where you’ll find a rotating selection of local and organic beers, a 70-bottle wine list (27 by the glass) and chic martinis. When your server brings out a tray of the freshest desserts, we bet you won’t be able to politely decline. They don’t call it an 1887 saloon for nothin’. This restaurant turns into a fun watering hole by night. The food, the beer and the waitstaff are all great. 80s music plays in the background as you enjoy your French onion soup (highly recommended by the locals). The focal point of Charity’s restaurant is an ornate antique bar crafted from cherry wood and marble in 19th century France and shipped to Killington 30 years ago. The Tiffany-eqsue stained glass lends a lovely touch to the rustic, saloon atmosphere. There are free wings during Happy Hour from 3 to 6 p.m.
Bar seats are occupied by skiers, who are a pretty lively crew. There are a couple of flat-screen TVs and a projector for big games. Try to arrive early, because the wait can get a little crazy after 7 p.m. Try the cheese fondue. Charity’s also serves some of the best burgers in Killington. The menu features a wide variety of food from steaks to seafood, BBQ to pasta. There are 16 microbrews on tap, and more than 35 specialty bottled beers. That’s sure to leave you feeling charitable.